Deer blinds must be mobile to maximize effectiveness. 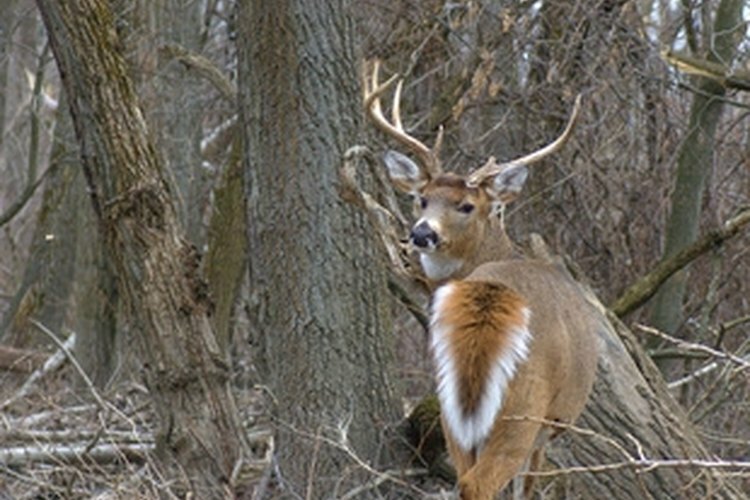 A deer blind will increase the odds of successfully harvesting game. The blind provides cover and concealment in the woods, but often moving a blind can be difficult because they are bulky or heavy. However, a deer blind built with PVC pipe can provide a sturdy yet light frame. This combination makes it an excellent do-it-yourself option when seeking a blind that can go from one hunting spot to the next with a minimum of fuss and trouble. Build a frame base from black PVC pipe. This can be accomplished by manually connecting the interlocking joints that are a characteristic of PVC pipe. The dimensions of the frame can vary, but the base should be a minimum of 9 square feet. This base should be built in a square, so each side should be the same length---to build a 9-square-foot base, each side should measure 3 feet long. Run vertical posts of PVC pipe from each of the corners of the base to a height of at least 5 feet. Like before, the pipes will connect with the interlocking joints that is a natural feature of their design. This should allow enough room to easily move around with adequate headroom from a seated position. Build another square frame and join them to the top of the vertical posts. This is the roofing structure for the deer blind and should be squared up at least 3 feet on each side so that it is a reflection of the base frame. Make sure the interlocking joints are positioned so that the posts fit over the vertical posts. Drape camouflage netting from the top of the frame and secure it with staples around the top frame PVC pipe, the vertical posts and the base. Make sure the netting is drawn taut so that it does not flap in gusting winds. Cut sight holes in each side of the blind so that there is plenty of room for the hunter to view the woods outside and extend a rifle through when a shot opportunity presents itself. Lay the blind on its side and enter through the base frame. Simply turn the blind right side up once positioned, situating the blind around a comfortable seated position.